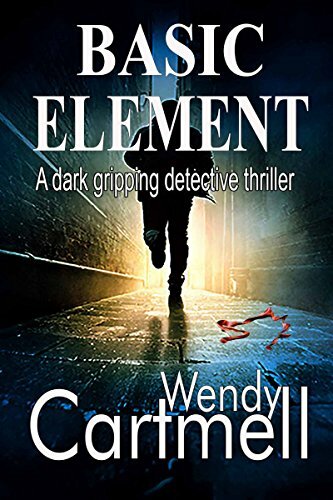 Basic Element has a complex plot, although it’s an enjoyable and easy read because Wendy Cartmell has a clear writing style. I haven’t read the first detective thriller by this author in the Crane and Anderson series but this didn’t detract from any understanding of the story; it’s a good stand alone book. The characters are well drawn and rounded. I especially liked Holly and Crane; there is a lot of good backstory with this last character that helps to give more layers to him. I loved the separate chapters written from each character’s point of view The chapters from the point of view of Boy read as reflective monologues and add to the evil of this character. And both the internal and spoken dialogue is believable and distinguishes all the characters. The description of the settings are evocative and well thought out, though, sometimes, there is an formalisation overload in the tell in, especially in that of the Reading University. Sometimes the sexual element of the plot is disturbing but this adds to the tension. If I had any problem with Basic Element it would be with the occasionally editing errors but, more importantlyn nding of the case which I found to be too sudden. But there is also an additional ending which leaves an opening for there to be another novel in this series… intriguing. A good read for those who enjoy crime/ psychological thrillers. This entry was posted in blogging, Books, Brook Cottage Books, crime, Physcholoogical Thriller and tagged books, novel by Judith Barrow. Bookmark the permalink. Judith Barrow with a review for Wendy Cartmell author of eight Crime novels. Today Judith is featuring Basic Element Book 2 of the Crane and Anderson series. Thank you, Tina. And I know, I almost read Boy with one eye closed!Jx! Thanks so much for the review, Judith! I really appreciate you joining in my book blog tour! The editing problems you mention were sorted for the published copy, as you had an ARC which hadn’t had the final proof read. I like dark and thriller and this seems to hit the mark. Thanks for the review! Very intrigued, Judith. I hope you enjoyed the fair! You’ve told me what I wanted to know, Judith. Thanks for a mindful review. Hugs.